Republicans are far more likely than Democrats to view the Democratic Party as very liberal. 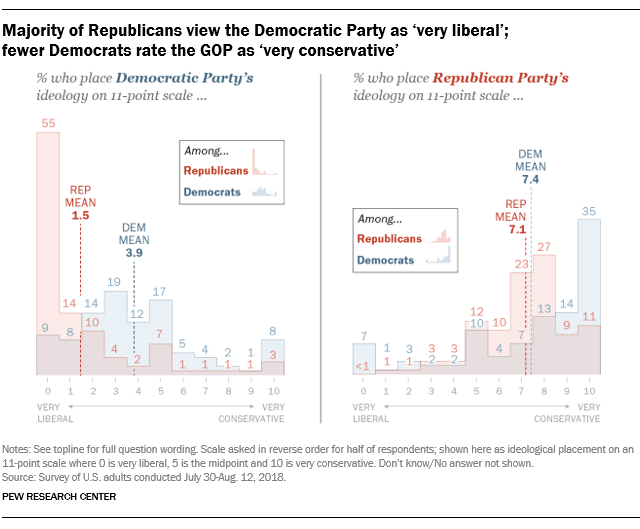 And the pattern is similar, though less pronounced, in views of the GOP’s ideology: More Democrats than Republicans see the Republican Party as very conservative. When asked to evaluate the Democratic Party’s ideology, a majority of Republicans (55%) give the Democratic Party the most liberal rating possible on an 11-point scale (where 0 is very liberal and 10 is very conservative). The share of Republicans who give the Democratic Party this ideological rating has increased 10 percentage points, from 45%, since 2016. 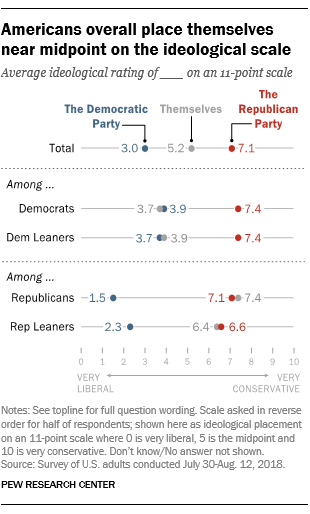 About a third of Democrats (35%) give the GOP the most conservative rating possible – which is far lower than the share of Republicans who place the Democratic Party at the most liberal point on the scale. Nonetheless, Democrats are much more likely than Republicans to rate the GOP’s ideology as very conservative. The national survey by Pew Research Center, conducted July 30 to Aug. 12 among 4,581 adults, finds that Republicans give the GOP an ideological rating of 7.1 on the scale. 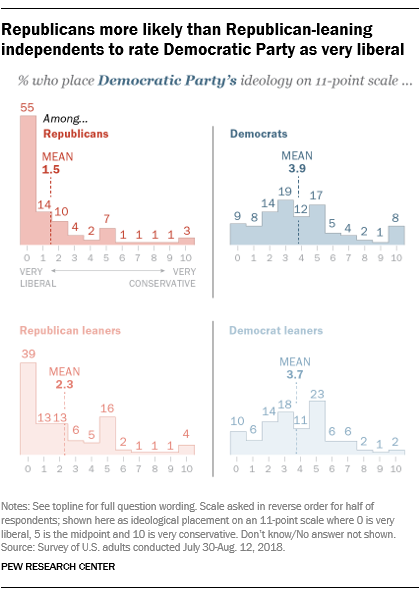 Democrats rate their party closer to the middle of the ideological scale (where 5 is the midpoint); on average, Democrats give their own party a rating of 3.9. 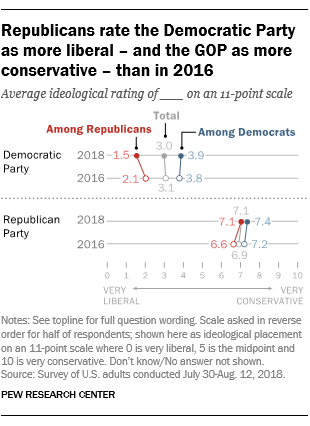 Republicans’ views of their own party’s ideology – as well as the ideology of the Democratic Party – have changed since 2016. On average, Republicans now place the Republican Party further to the right on the ideological spectrum than they did two years ago. And on average, Republicans see the Democratic Party as further to the left than they did in 2016. There has been less change in Democrats’ ratings of the ideologies of both parties since then. Overall, Americans place themselves close to the midpoint on the ideological scale, with an average rating of 5.2. More than half (53%) rate their own ideology between 3 and 7 on the scale, including about one-in-five (22%) rate themselves at exactly 5. Republicans’ and Democrats’ ratings of their own ideologies are similar to ratings they give their parties. Republicans, on average, give themselves a 7.4 rating and rate the Republican Party 7.1. The average self-rating among Democrats is 3.7 on the scale and their rating of the Democratic Party is 3.9. 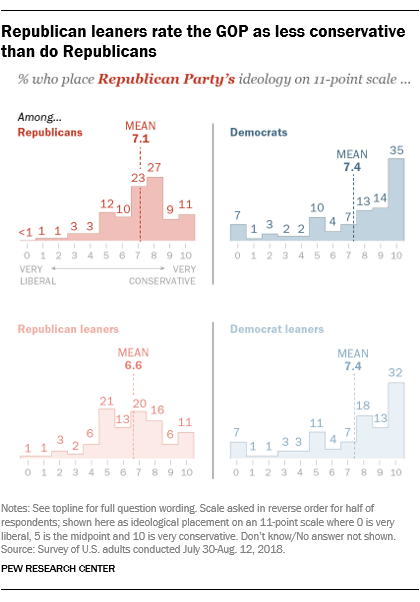 The 11-point ideological scale results in a somewhat different picture of the public’s ideological leanings than a commonly used survey measure that asks whether people describe their political views as very conservative, conservative, moderate, liberal or very liberal. Overall, 25% of the public place themselves at the most conservative end of the ideological spectrum (a rating between 8 and 10); 16% rate their own ideology as a 6 or a 7, while about one-in-five (22%) place themselves at the midpoint on the scale. On the left side of the scale, 16% give themselves a rating of 3 or 4; another 21% place themselves at the most liberal end of the scale (between 0 and 2). There are age and educational differences in how people rate their own ideology. Among adults under 50, more place their ideology at the liberal (23%) than conservative (17%) end of the scale. Among those 50 and older the ideological balance is reversed: 34% use one of the most conservative points to describe their ideology, while 19% use one of the most liberal points. Adults with postgraduate degrees are more likely to rate their ideology as very liberal (34%) than very conservative (16%). By contrast, more of those with no college experience rate their ideology as very conservative (32%) than very liberal (14%). While a 55% majority of Republicans rate the Democratic Party at the most liberal point on the ideological scale, independents who lean toward the Republican Party are less likely to view the Democratic Party as this ideological; 39% rate the Democratic Party at the most liberal point. Democrats and Democratic-leaning independents have similar ratings of the Democratic Party’s ideology. Those who identify as Republicans are more likely than GOP leaners to view the Republican Party as conservative. While identical 11% shares of both groups give the GOP the most conservative rating of 10, Republicans on average are more likely to give the GOP a conservative score of 6 through 9 than are independents who lean Republican. There is little difference between Democrats and Democratic-leaning independents in views of the Republican Party’s ideology.